What do butterflies have in common with the human spirit? Meet Maggie, a middle aged wife and mother who was about to find out. Maggie wasn’t rich like a millionaire or poor in a manner of being homeless. She was living an average comfortable life. It was made even better when a beautiful baby girl came her way. Her and her husband made sure their daughter had her needs met and they were still able to take a yearly vacation by the beach. Maggie was a partner in her husband’s business. They both had a different set of duties which kept everything in balance. One day a devastating blow came to her husband’s business, and over a three year period the business dropped out of site. Her husband had to totally reinvent himself and was yearning to fulfill a dream with a new vocation. She was happy for him and supported him fully, but still the money was not coming in. Maggie began to feel guilty that she wasn’t contributing with any kind of income. It had been a long time since she had worked outside the home and had to work for someone else. Needless to say she was scared but still had faith that everything would be OK. She began job hunting and found it somewhat difficult in filling out applications, especially the part asking for job references. Keep in mind that she was self-employed with her husband for almost 20 years. It felt as though that didn’t count for anything as she was never called for an interview. At the time she was job hunting her mom became more ill than she had been and ended up in the hospital for a week. Once Maggie’s mom returned home she became her mom’s helper one day a week. She did the shopping, changed sheets, vacuumed and did other things that her mother was not able to do anymore. Of course her mom would pay her for her time and labor but she still felt she needed to find another source of income. One of the first applications she had filled out finally came through. She passed the interview with flying colors and was told she was “exactly” what they were looking for. Although it was only part time it was exactly what she wanted. It was important for her to be home when her daughter arrived home from school. She was told they would be in touch when the schedule was ready. Knowing she had the job made her feel contented and productive again. Within a few weeks though, she received an e-mail saying that the company had changed the job into a full time position and she was not qualified. Maggie was devastated. She felt betrayed and felt she had been lied to. That evening she was alone as her husband and daughter had gone out for the night. She welcomed the aloneness and wanted to drown her sorrows in a hot tub of bubbles. As she knew she would, she began to cry, softly at first just from the sheer pain of being rejected. Three long years of struggle had finally caught up with her. Then she became angry; angry at everything from the circumstances that got her there, to God himself. She cried harder and yelled, “What do you want me to do”? She really felt that God had abandoned her. When she was able to cry no more, she became exhausted and gave up. It was at that moment that a silent idea came to her to offer other elderly people home care assistance. Using another talent for computers she printed off some flyers and cards and distributed them to her church, grocery stores and even placed a small ad in the newspaper. Within a week she had procured two new clients. Now, even though she’s not a CEO of a major company or a power player she feels happy and productive again. So, had God really abandoned her? Let’s look at nature for the lessons and the answer. 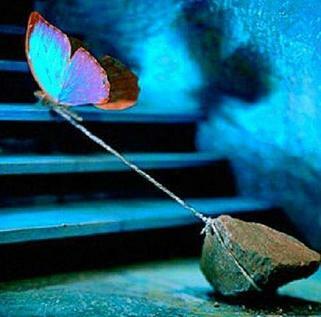 Before a butterfly can emerge out of it’s chrysalis it has to go through a lot of struggling. Yes, struggling. Each time it lunges out to escape, acids are being removed from its wings. If someone were to come along and break the chrysalis open for it then the butterfly would die from those acids. In essence the struggle is necessary for the butterfly to survive. Then in the stillness, when the struggle is over, the butterfly can come out and share its beauty with the world. We as humans are not any different. There are times that we need to struggle, to rid ourselves of the acids that make up sadness, fear, and anger. It is only at this time when we are exhausted and still that we begin to hear the Universe whisper to us. A moral lesson inspired by the butterfly about the challenges and struggles of life. Spiritual transformation, like the physical metamorphosis of the butterfly, is a very difficult and often painful process. However, transformation requires growth and change, and so for our souls to fly free, we must embrace the growing pains.